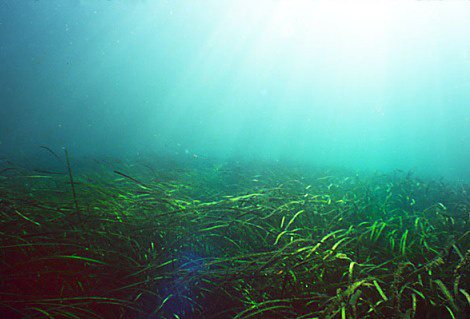 Seagrass meadows provide valuable habitat. Photo by Randy Shuman. The backshore is defined as that area of shoreline lying between terrestrial vegetation and the average high-tide line, which is affected by waves only during severe storms. Backshore areas support a variety of vegetation, dunegrass, for example, that are tolerant of salt spray and wind. This vegetation helps stabilize the shoreline so it does not erode away. Drift logs and other natural debris are deposited on the backshore over a large portion of the King County shoreline. Over 100 species of marine and terrestrial insects alone are associated with the backshore, and many bird species, such as shorebirds and swallows, forage on these insects. Intertidal and shallow subtidal habitat includes rocky and soft bottom substrates that extend from the average high-tide line down to a depth where benthic aquatic plants are no longer found (i.e., the photic zone). Over 150 species of benthic (attached to the bottom) marine plants have been documented in King County. Rockweed is a common species found in the upper elevations of rocky shorelines, and sea lettuce and the brown alga Laminaria dominate mid- and lower-intertidal rocky areas. In several patchy areas, the shallow subtidal zone also contains kelp forests (Nereocyctis sp. ), which provide important ecological functions, such as cover from predators and rearing habitat for species such as rockfish, crabs, and shrimp. Seagrass (specifically, Zostera marina), one of the most important marine plants in Puget Sound, is common but intermittent along most of the shoreline. It stabilizes sediments and provides nursery area for young crabs, shrimp, and fish. There are continuous seagrass meadows along portions of Vashon Island and sections of the northern Puget Sound shoreline of King County in the subtidal zone. Over 500 invertebrate species have been documented in King County intertidal/shallow subtidal habitat. The distribution of invertebrates is mainly related to substrate type. Geoducks (pronounced gooey-duk), the largest intertidal clam in the world, are found along most shorelines, as are other important commercial and recreational invertebrates such as Dungeness crabs and butter clams. More than 60 species of marine fish use intertidal and shallow subtidal habitat in King County. This habitat is particularly important for juvenile Chinook and chum salmon and for three species of forage fish (surf smelt, sand lance, and Pacific herring). Surf smelt and sand lance spawning habitat occurs throughout King County’s intertidal and shallow subtidal habitat, but the only Pacific herring spawning site in King County is in Vashon Island’s Quartermaster Harbor. Shorebirds and waterfowl, such as sandpipers, horned grebes, and great blue herons use intertidal and shallow subtidal habitats throughout King County to feed on vegetation and invertebrates. Deep subtidal habitat extends from the photic zone down to the seabed; in Puget Sound this region extends downward to about 268 meters (879 feet) off of Point Jefferson. The majority of King County’s portion of Puget Sound is the deep subtidal habitat. Plankton in this habitat provide the basis of the Puget Sound food web and generate nutrients and oxygen for other organisms. Plankton species are not well documented in Puget Sound. Over 500 benthic and 50 pelagic invertebrates have been documented in King County’s deep subtidal habitats. Puget Sound, including King County, is home to the giant Pacific octopus, the largest octopus in the world, and to the giant acorn barnacle, the largest barnacle in the world. Other distinctive invertebrates in this habitat include the Puget Sound king crab and the commercially important spot prawn. Over 150 species of marine fish use deep subtidals areas, including rockfish, adult forage fish, flatfish, and sharks. Several of the larger species, including the six-gill shark and wolf-eel, occur in King County waters. Commercially important marine fish include the salmon species, Pacific herring, and bottomfish, such as cod, pollock, and rockfish. Populations of Pacific hake, Pacific cod, walleye pollock, spiny dogfish, and several rockfish species have severely declined over the past twenty years because of over-harvesting, toxic contaminants, declines in prey resources, and changes in habitat quality. Over 100 marine bird species are found in Puget Sound, and most of these species likely use King County marine waters at some point of the year. Some species are permanent residents, whereas others may be summer residents (breed), summer visitors (do not breed), winter visitors, or spring and fall migrants (for more information, see the discussion on birds in Section 1.3). Many of the seabird and seaduck populations are declining to dangerously low levels, and since 1970, the total number of marine birds in the region has dropped by 47 percent. Possible causes of these dramatic declines include reduction of prey (especially forage fish), oil spills, contaminants, and disturbance to breeding areas. Nine species of marine mammals have been documented in King County waters. The Steller sea lion, harbor seal, and Dall’s porpoise may be seen year-round, whereas the California sea lion, gray whale, and killer whale are seasonal visitors. Humpback whales, minke whales, and sea otters, when present, are uncommon visitors in King County waters. Killer whales were recently listed as endangered because of population declines. Causes of decline are thought to include effects from toxic contaminants, the once-common practice of capture for aquarium display, declines in prey abundance, and stress from whale-watching activities. Riverine/sub-estuarine habitat includes the area where rivers or streams meet Puget Sound, which results in a mixture of salt and fresh water. Riverine and sub-estuarine habitats support a variety of species because of the complexity of habitat from the mixture of fresh and saltwater. This habitat provides feeding and refuge areas for a variety of animals including crabs, shrimp, salmon, seaducks, shorebirds, and sea lions. There are two large riverine/sub-estuarine areas within King County: the Duwamish River estuary, which empties into Elliott Bay along the Seattle waterfront, and the outlet for the Lake Washington Ship Canal, which empties into Shilsole Bay. Both of these systems are important for migrating salmon. There are several other smaller sub-estuaries within King County. The Duwamish River sub-estuary has been highly modified since the late 1800s, when the river was straightened and armored along most of the shoreline to facilitate navigation and industry. The Lake Washington Ship Canal was created in the early 1900s to provide a navigational link between Lake Washington and Puget Sound. Historically there were large coastal wetland complexes (or salt marshes) throughout Puget Sound. The size distribution of these complexes has shifted downward over the past 150 years because of shoreline development. The median size is about three-fifths the historical size. The Central Puget Sound area, where King County is located, has had the highest loss of wetland complexes, with less than 30 percent of the historic wetlands still remaining today. The largest tidal marshes within King County, located within the Duwamish River and Elliot Bay, were almost entirely filled and developed over the past 100 years. Of the remaining wetland complexes in King County, over 60 percent occur on Vashon and Maury Islands. Furthermore, the remaining 40 percent on the mainland shoreline have been highly altered, whereas the wetland complexes on the islands have not been as severely altered because of less development pressures. There are only a few areas in Puget Sound with large tidal flats and huge expanses of seagrass beds, but because of the geology of the area these do not exist within King County. The Puget Sound shoreline in King County is dominated by relatively steep slopes, with a narrow shelf that was notched into by wave action as sea levels rose after the last glaciation. These shelves are relatively narrow, providing opportunities for patchy fringing seagrass beds (as opposed to large contiguous beds). There is also a species of nonnative seagrass (Zostera japonica) present on the shelves, though it generally grows at a higher intertidal height than the native seagrass (Z. marina). Although there are fringing seagrass beds throughout King County, there are currently fewer areas with kelp beds (primarily Laminaria and Nereocystis); the majority occur along the shorelines of Vashon and Maury Islands. It is believed that the extent of kelp beds was much greater in the early 1900s. Sargassum, a nonnative algal species, is found throughout King County’s marine shoreline in patchy beds. 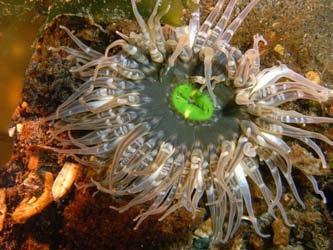 Although it does have the ability to displace native brown algae, it has also been shown that it generally supports a more species rich fauna community than the native brown algae. Approximately 70 percent of the marine shoreline within King County has been armored or bulkheaded. These alterations have had a significant negative impact on the sediment delivery and transport processes. This armoring has caused the loss of 64 percent of all the eroding bluff sediment sources within King County. There has been a similar loss of accretion beaches, with almost 50 percent being lost, with a large portion of the remaining beaches being heavily altered by development. These impacts are more focused along the mainland shorelines, especially the northern half. The most intact shorelines are found along the southern most portions of the county and along Vashon and Maury Islands.